Every week we pull a new artifact from our archive and share it across social media. We then link all those posts back to this page where you can read about how that artifact is connected to our town here in Kennebunkport! 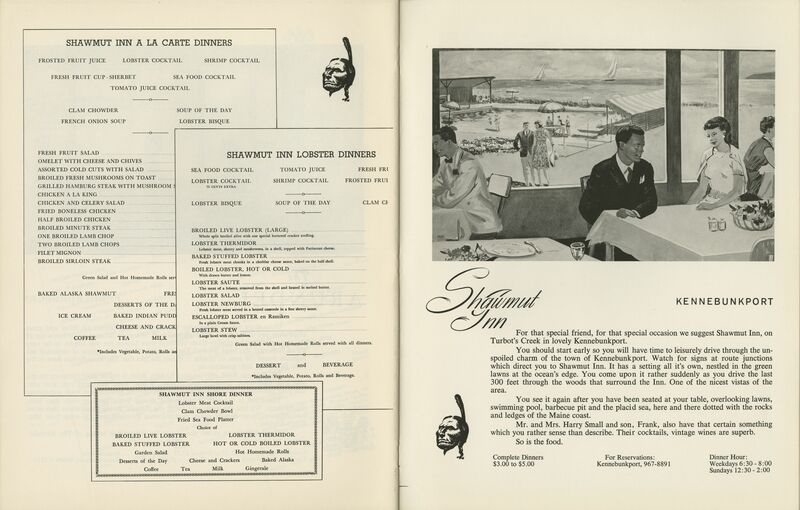 This 1963 dining guide to Southern Maine suggests nine of the most popular spots for tourist and locals alike. 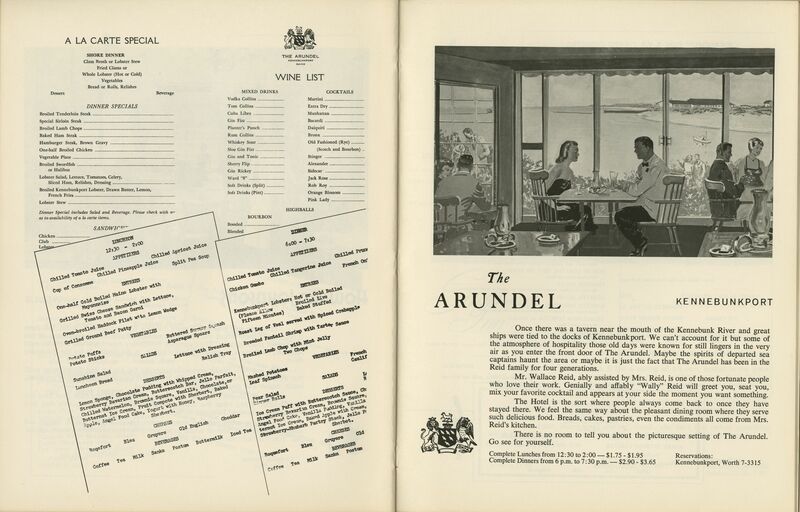 Flipping through this guide reminds the reader of a time when a night out was an elegant affair full of pre-set multi-course meals, dress codes, and $0.80 martinis. A number of the restaurants boast about their famous clientele often actors of screen and stage performing at one of the regions acclaimed playhouses for the season. While not strictly speaking historic, Jeb Bush was kind enough to send along a box full of campaign materials for use in our summer exhibit at the First Families Museum. 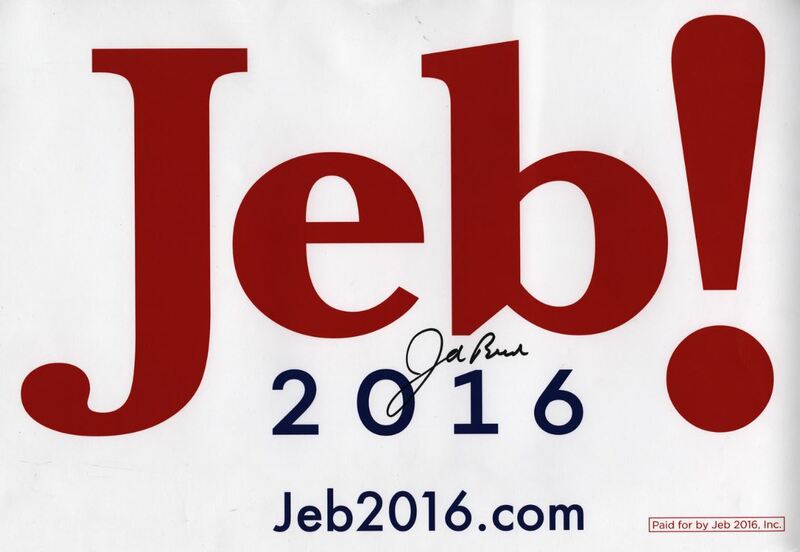 Upon cataloging Jeb’s donation it became apparent that the majority of these campaign materials, often given away for free at rallies and speeches, were high quality and made in the United States. While Jeb bowed out of the Republican Primary Race in late February his campaign matterials and methods proved to be distinctive and unique, something that will be on full display in the First Families Museum’s exhibit “Campagin” opening Memorial Day Weekend. In 1947 Kenneth Roberts released his 19th publication Lydia Bailey, a love story set in the Haitian war between 1798 and 1802. This was number 7 of 8 historical fiction novels Robert’s published during his lifetime. 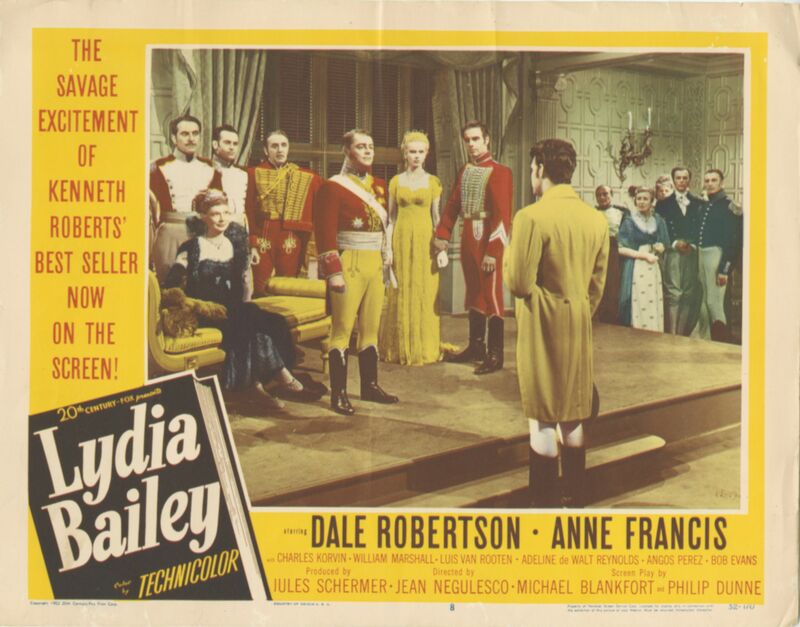 In 1952, just five years after the novels release, Lydia Bailey became a major motion picture. The screenplay was written by Michael Blackfort, a contributing writer on Humphry Bogart’s 1954 film The Caine Mutiny. While the film’s stars, Dale Robertson and Anne Francis, did not become house hold names a supporting cast member, Robert (Bob) Evans went on to become an Oscar nominated producer of the 1974 classic, Chinatown. The film was 89 minutes long and produced in technicolor. Roberts summered in Kennebunkport throughout his life, and died in Kennebunkport in 1957 at the age of 71. Despite being a ship building town from colonial times it wasn’t until 1806 that Kennebunkport was able to make its own rope for rigging. Before industrialization rope had to be spun by hand, this took a skilled tradesmen and a lot of space. In 1806 Thomas Goodwin, of Portland, moved to Kennebunkport and built a ropewalk, what is today the Arundel Yacht Club on Ocean Ave. Ropewalk’s are long narrow buildings where the yarns are laid out and spun into finished rope. The longer the ropewalk the longer the length of rope. It takes over 20 miles of rope to rig one 1000 ft schooner. In Kennebunkport, and much of the north, hemp was the base fiber used in rope. It was the ideal raw material because it does not require a warm climate to grow and could easily be waterproofed by tar dipping the fibers, yarns, and finished rope. The American Civil War was a time of great change across the nation, and no town was left unaffected. In Kennebunkport the war took and gave in equal measure. When President Lincoln began organizing the Union Army he put in place quotas for each state left in the Union. Maine was required to send 17,560 able-bodied men between the ages of 18 and 45 to fight for the preservation of the United States, Kennebunkport had 419 men fitting that description. 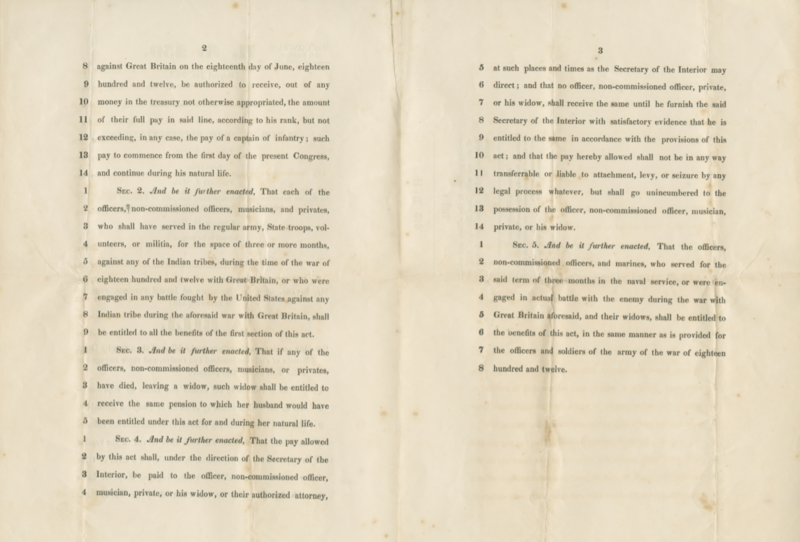 Terms of service ranged from 90 days to 3 years, and for the duration of the war Kennebunkport, along with every other town in the nation, was shorthanded on men. This became especially problematic when many of the towns key economic markets increased in demand in connection with the war. Crop farmers and shipbuilders found themselves outstretched to meet the war demands. Meanwhile, with embargos in the South creating a serious cotton deficit, those who dealt in wool became the most important persons in the community. The War also resulted in a surge of patriotism. Even Celia Nott Perkins herself could be seen sewing red, white, and blue bunting and hanging it from her second story porch at White Columns. 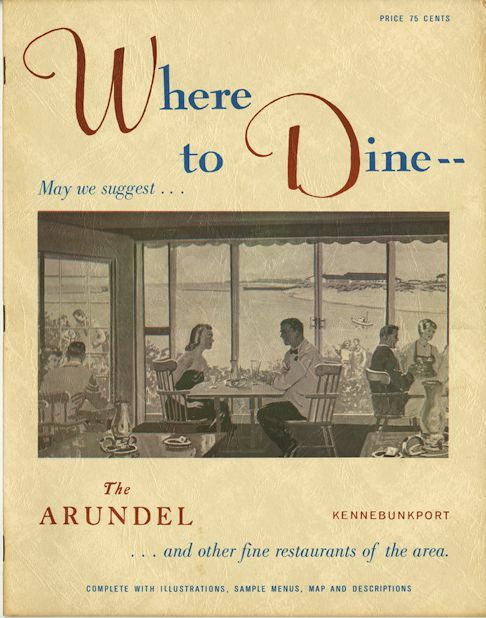 While this item is not specific to Kennebunkport, it does provide insight into Kennebunkport “golden age”. 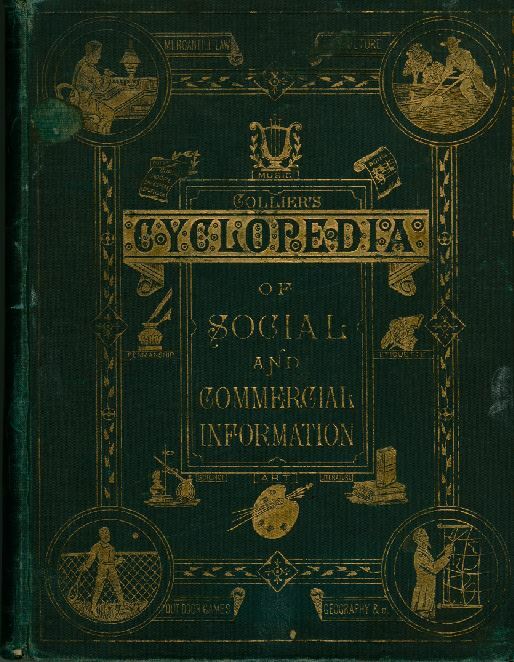 Published in 1887, Colliers Cyclopedia provides a detailed overview of the social constructs of Victorian culture. 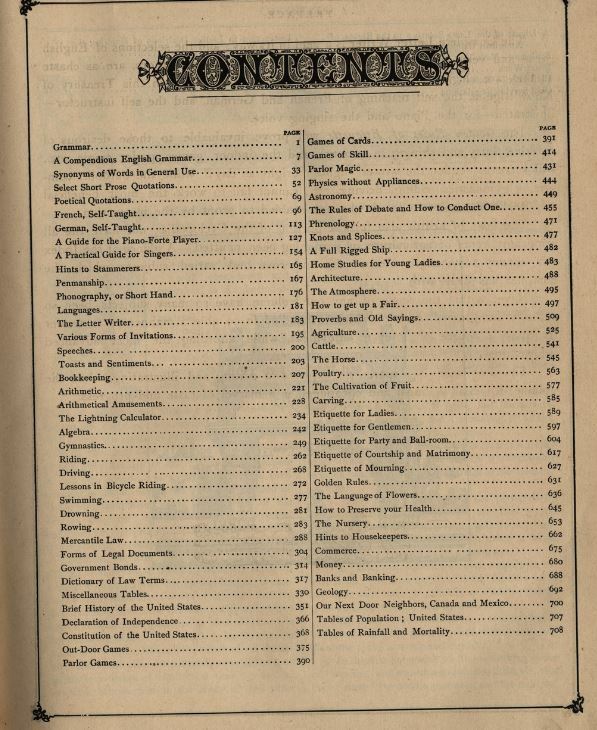 This cyclopedia includes how to guides for magic tricks, swimming, civilized behavior – for both men and women-, math, grammar, and penmanship, and more. The Nonantum Hotel opened on July 4th, 1884 with only 28 rooms and a ten person staff. By 1937, when this brochure was published, it had already made an additional land purchase and three building additions including the front piazza (1902) and the right wing (1930). Today the hotel consist of two buildings and a marina while boasting a four and a half star Trip Advisor rating and receiving consistent praise from the wedding market. 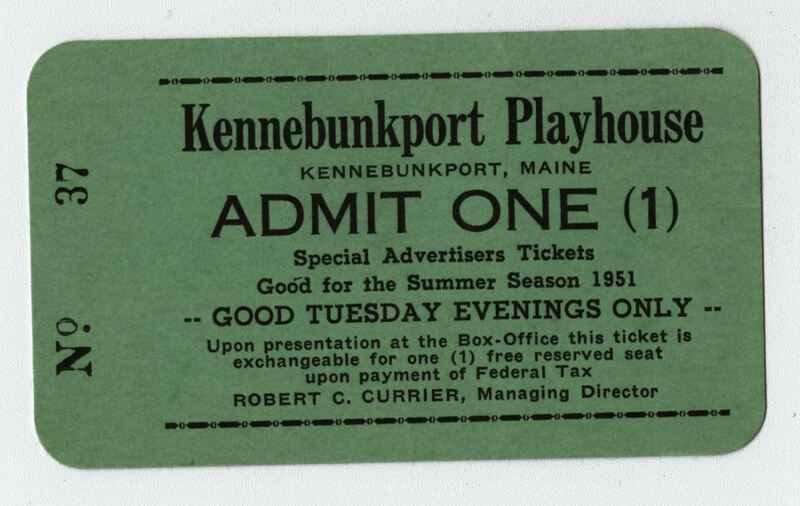 In 1961 the Kennebunkport Playhouse was put up for sale. Robert Currier, the owner, placed a real-estate ad which read “FOR SALE – KENNEBUNKPORT PLAYHOUSE: Located in an insane community…” These five words caused an uproar in the community and a civilized war broke out: Robert Currier vs. Everyone Else. 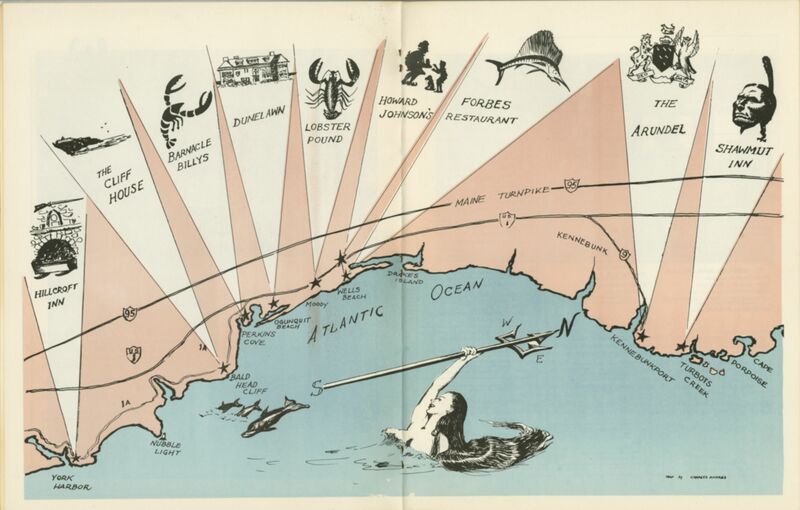 Amongst the first punches thrown was a play written and produced by the Kennebunk River Club entitled Codfish Capers: An Insane Show for An Insane Community which did for Robert Currier what Citizen Kane did for William Randolph Hearst (only in a delightful farce format). Newspapers served as an important battleground for the dispute. Currier gave a number of interviews defending his comments expressing, “I don’t know if I could prove the town itself is deranged, but it wouldn’t be very hard to prove a lot of the people here are nuts.” The townspeople responded in kind through a number of articles and open letters. Eventually the dispute generated enough smoke to attract national media outlets, such as the New York Times, the Boston Globe, and Time-Life magazines, which all published puff pieces about the big fish causing waves in his little pound. The Kennebunkport Playhouse was a cultural landmark from 1930 until 1971 when it caught fire causing damage beyond repair. During its 41 year run the Playhouse boasted names such as Jane Morgan, Russel Nype, Gene Hackman, Joan Caulfield, Betty White, Tom Poston, and put on six to upwards of 10 shows a season. In 1951, the season this ticket was from, the Playhouse staged “Arms and the Man”, “Clutterbuck”, “The Silver Whistle”, “A Street Car Named Desire”, “The First Year”, “Jenny Kissed Me”, “The Two Mrs. Carrolls”, “No Time for Comedy” & “Janurary Thaw”. Carolyn A. Pratt was born to Rev. Frank H. Pratt and his wife Nellie of Kennebunkport in 1909. At the age of 18 she became a missionary within the British Empire and spent the better part of thirty years as a teacher to young female colonist in and around Cairo, Egypt. She was well loved by her students and spent much of her free time traveling and learning about the local cultures. In our archive we have two albums of her photographs (apx. 500 photographs in total). Most of her photographs are of people and span the years 1927 through 1956 coinciding with the end of Birtish empirical control of Egypt. Award winning playwright and novelist Booth Tarkington was distinctively fond of his cigarettes; so much in fact that he had them personally monogramed with his initials “B.T.”. Tarkington special ordered these cigarettes from New York City and had 100 shipped to him every month. According to this complaint filed with the Kennebunkport Post Office in 1937 Tarkington paid $ 4.23 for his vice, 83% more than the average cost of cigarettes. The average cost of 100 cigarettes in 1937 was $0.75 (adjusted for inflation that would be $12.67 in 2016), Tarkington’s cigarettes cost $4.23 (adjusted for inflation that would be $74.66 in 2016). He even had special cases made in which to ship his cigarettes, also monogramed with his initials. 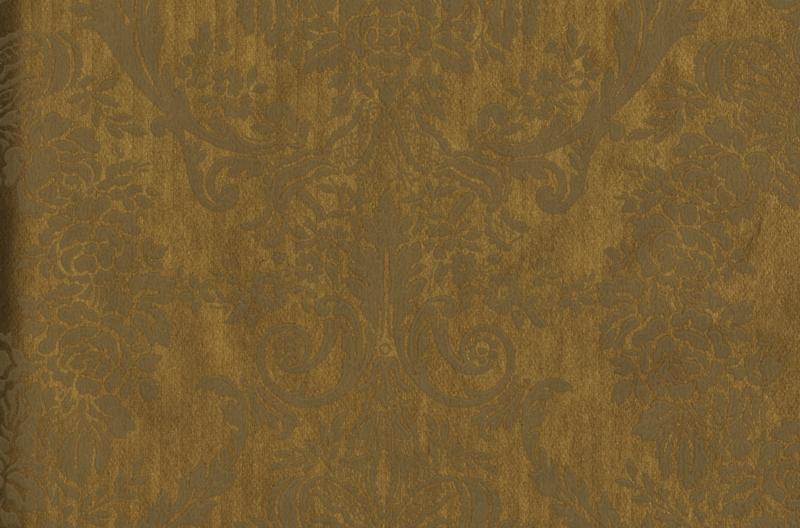 Off white hand stenciled floral pattern over two-tone gold-leaf pinstripe. 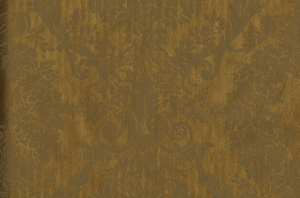 Originally used in a home in Kennebunk the remaining paper was used in the Colony Hotel, Kennebunkport ME. Two rolls of the wallpaper remain unused and are currently stored in our archive. Seventeen is a classic coming of age comedy by Booth Tarkington. Originally published in Metropolitan Magazine in 1914, it became a bestselling novel just two years later. This particular sheet music is from a Samuel French adaptation of Seventeen which was performed in numerous theaters across the county, including the Kennebunkport Playhouse in the early 1960s. 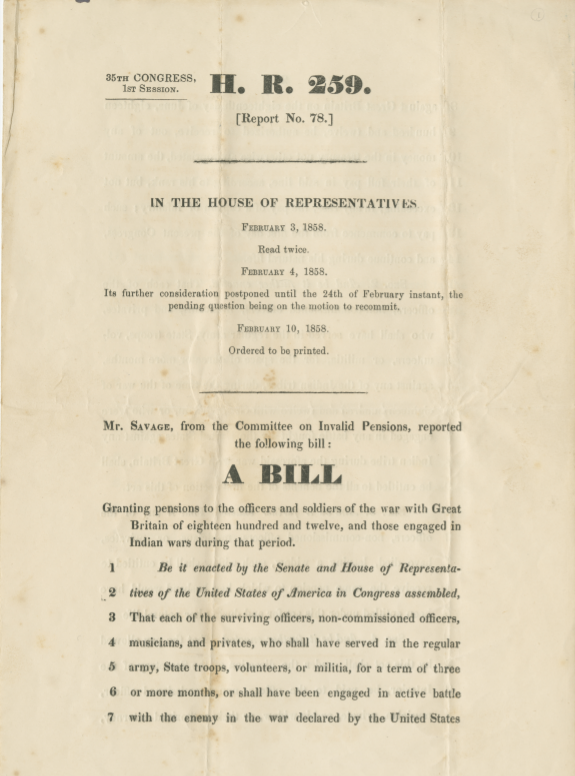 Read before congress on February 3, 1858 and again on February 4, 1858, Bill 259 proposed granting pensions for officers and soldiers who served in the War of 1812. At the time there were six (6) representatives for Maine sitting in the House of Representatives – all republican: John Wood (abstained), Charles Gilman (Nay), Abbott Nehemiah (Yay), Freeman Morse (Nay), Israel Washburn (Nay), Stephen Foster (Yay). Ultimately the bill passed establishing pensions for the veterans. While Hallmark started making greeting cards in 1910 these particular cards were on the market sometime between 1928 – 1935. The Kennebunkport Historical Society has a large collection of old greeting cards, both handmade and mass marketed, for a number of small family collections. George H.W. Bush’s family summer home is located in Kennebunkport on Walker’s Point. Throughout all of the Bush family election campaigns Kennebunkport has rallied around its first family, hosting election events and rallies. This piece comes out of our expansive George H.W. Bush collection. Jeb Bush, 2016 presidential hopeful, also has a summer house on Walker’s Point.